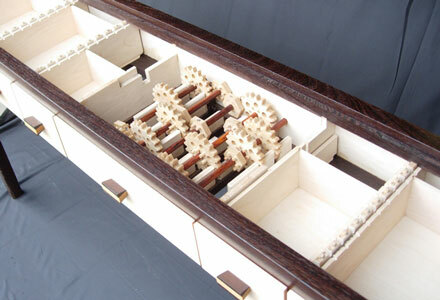 In December of 2005 I designed a table inspired by the mechanism of the Pattern Box. The design was submitted to a jury at the Lilly Library. 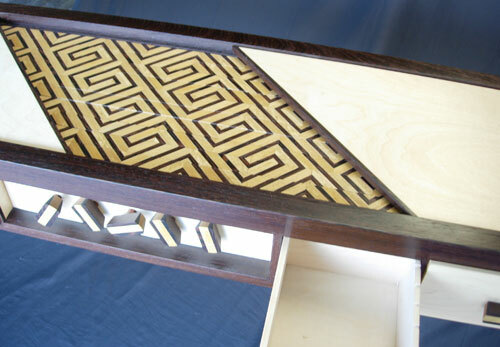 The contest, arranged by Jerry Slocum, and the Lilly Library, stipulated that a table be made with a puzzle mechanism. Also the table had to reveal secret compartments once solved. I was awarded the commission to build the table soon after. Only Akio Kamei was the other person to receive this award. I had a very short amount of time to make the table, and furthermore, I had never even made a normal table! Thanks everyone for trusting me to make this! Now I had my work cut out for me. The Cafe Wall Table needed to be ready before the grand opening of the Slocum Puzzle Room four months later. The room is the perfect museum setting for one of the finest puzzle collections. Jerry Slocum's collection of Puzzles are to be on permanent display to anyone seeing the various exhibits about the library, and anyone can access the puzzles for study in the room itself. The Lilly itself is renowned for its collection of books. The addition of Jerry's puzzle collection is a perfect match! Now, two tables are on permanent display in the Slocum Puzzle Room as centerpieces. Why is it called the Cafe Wall Table? Originally I was not sure what to call it. Often my friends would visit me when I was busy building it. They would glance at the striped runners, asking if I hade made these very accurately. Of course they were accurate. I knew this because I had made them myself. Most people seemed to think I cut these a little crooked. The truth is, the stripes form a version of an optical illusion called the Cafe Wall Illusion. The table has six drawers all locked. The middle face plate removes to reveal five knobs. These can be turned, pulled out and turned again in any way you please. You will notice these knobs control the decorative runners framed within the table top. These slide back and forth creating various patterns. Pull out a knob and a turn it, and a different strip moves. Hidden about the table are small patterns, or clues. If you can build these into the table top then a drawer unlocks. Possibly a new clue is hidden inside the drawer? One of the challenges to making the table was to make it very high quality, and also be reasonably easy to ship, and assemble. To solve this the legs had to be removable. 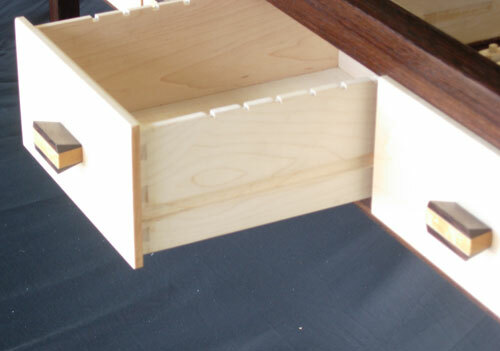 Each table joints into the frame and is held secure with a bolt from underneath. Each drawer is numbered to it's corresponding slot and slide in. Amazingly, each slider drops into place corresponding with ten numbers, two trapezoid ends also drop into place above the sliders, and the plate glass drops into the frame above these. The weight of the glass holds everything in place, and furthermore, no on can cheat by lifting up the glass. It is too difficult to get a finger under the glass once it is in the frame. There is a secret way of removing the glass that only the owner of the table will know how to do. From here the table is all set to go. I decided to make the Cafe Wall Table from some of my favorite woods. The dark structure of the table is composed of wenge. 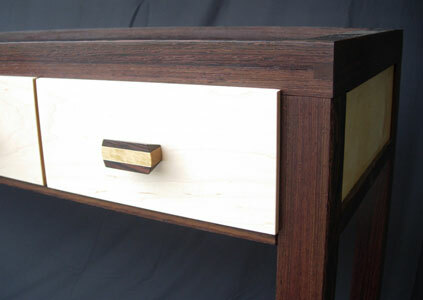 The drawers from maple. 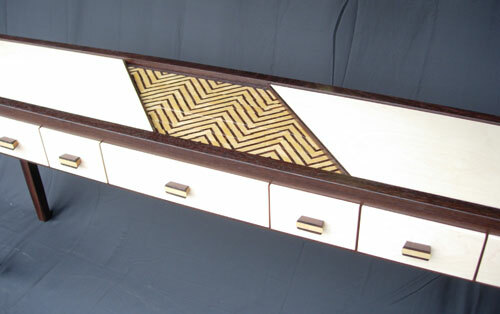 The sides of the table and the interior structure is made from birch. 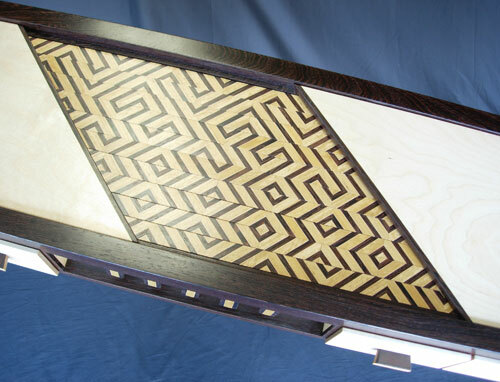 Seated within the mitered wenge frame is a 1/4" plate glass top. Below the plate glass are ten stripped moving strips. These are composed of wenge, a maple pinstripe, and Ceylon satinwood. The woods are finishes with a shellac, and tung oil. Within the table table is the "transmission". 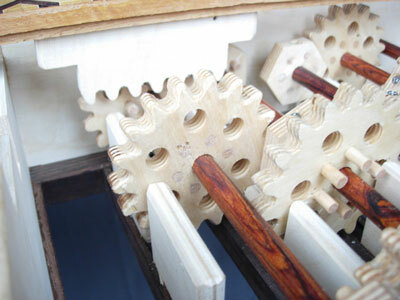 The gears are made from birch, some have maple pegs that register the gear teeth. The shafts had to be a very very sturdy wood. I chose to make these from cocobolo. All of the gears are held in place with tiny set screws allowing easy repairs and adjustments.